Outdoor Tennis Court Renovation Tennis courts by the Illini Grove on Dorner Drive and Pennsylvania Avenue in Urbana are currently closed for construction. The new courts should be finished by the end of June, weather permitting. After those are back open, the courts at the Outdoor Center Playfields on First Street and Gregory Drive will be closed for construction until the middle of August. Bike to Work Day UIUC Bike to Work day will be celebrated on May 1. Register today! April 24-29: Illinois Marathon; ARC Gym 1, Gym 2, Gym 3, MP1, MP7, Auditorium; Increased traffic in and around ARC April 25 & 26 due to Marathon Expo and race packet pick-up; Limited access to ARC facility due to street closures and race routes the evening of April 26 and most of the day April 27. May 3-5: No outdoor fields will be available during these dates. Check out this week’s Tuesday Tips video brought to you by Campus Recreation Fitness! Tis the season for our spring Wellness on Wheels Sessions! 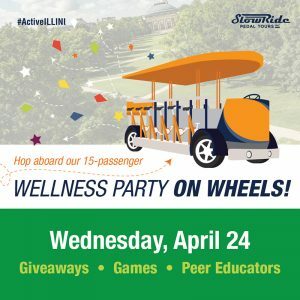 Be sure to watch out for us on the Slow Ride Pedal Tour this Wednesday, April 24 from 12-2pm while we travel from the ARC to the Quad with stops by the Bookstore and along Fourth, Gregory, and Wright Streets. 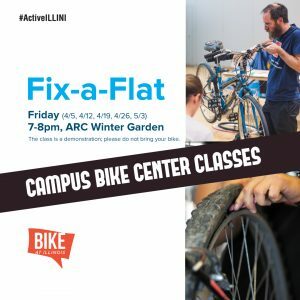 Stop by the ARC Winter Garden this Thursday, April 25 from 7-8pm for an informational demonstration how Bike Maintenance 101! Reminder, no need to bring your bike. Interested in learning how to Fix a Flat Tire? Head over to the Campus Bike Center this Friday, April 126 from 11 am-12 pm. 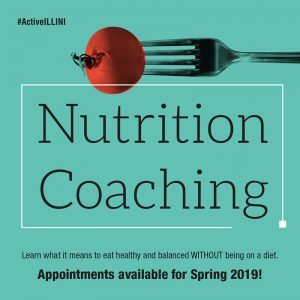 These workshops will be held every Friday at the same time until May 3, 2019. Building Signage Updates Campus Recreation has upgraded our signage to reflect the revised University branding guidelines. 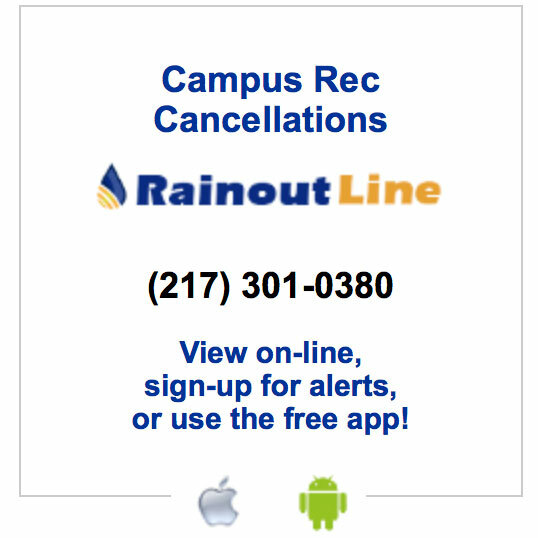 Please take the opportunity to review the policies including wording changes around technology and use of various devices such as cell phones in our facilities.